« Why Are GOP Leaders Negotiating a Bad Budget Deal When There’s already a Good Budget Deal in Place? I’m pleasantly surprised by the tax plans proposed by Marco Rubio, Rand Paul, Jeb Bush, and Donald Trump. In varying ways, all these candidate have put forth relatively detailed proposals that address high tax rates, punitive double taxation, and distorting tax preferences. But saying the right thing and doing the right thing are not the same. I just did an interview focused on Donald Trump’s tax proposal, and one of my first points was that candidates may come up with good plans, but those proposals are only worthwhile if the candidates are sincere and if they intend to do the heavy lifting necessary to push reform through Congress. Today, though, I want to focus on another point, which I raised starting about the 0:55 mark of the interview. For the plans to be credible, candidates also need to have concomitant proposals to restrain the growth of federal spending. I don’t necessarily care whether they balance the budget, but I do think proposals to reform and lower taxes won’t have any chance of success unless there are also reasonable plans to gradually shrink government spending as a share of economic output. As part of recent speeches in New Hampshire and Nevada, I shared my simple plan to impose enough spending restraint to balance the budget in less than 10 years. But those speeches were based on politicians collecting all the revenue projected under current law. By contrast, the GOP candidates are proposing to reduce tax burdens. On a static basis, the cuts are significant. According to the Tax Foundation, the 10-year savings for taxpayers would be $2.97 trillion with Rand Paul’s plan, $3.67 trillion under Jeb Bush’s plan, $4.14 trillion with Marco Rubio’s plan, all the way up to $11.98 trillion for Donald Trump’s plan. Those sound like very large tax cuts (and Trump’s plan actually is a very large tax cut), but keep in mind that those are 10-year savings. And since the Congressional Budget Office is projecting that the federal government will collect $41.58 trillion over the next decade, the bottom line, as seen in this chart, is that all of the plans (other than Trump’s) would still allow the IRS to collect more than 90 percent of projected revenues. Now let’s make the analysis more realistic by considering that tax cuts and tax reforms will generate faster growth, which will lead to more taxable income. And the experts at the Tax Foundation made precisely those calculations based on their sophisticated model. 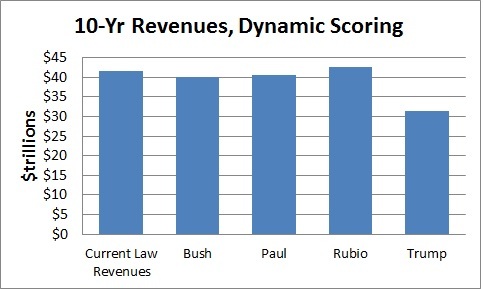 The Trump plan is an obvious outlier, but the proposals from Jeb Bush, Rand Paul, and Marco Rubio all would generate at least 96 percent of the revenues that are projected under current law. Returning to the original point of this exercise, all we have to do is figure out what level of spending restraint is necessary to put the budget on a glide path to balance (remembering, of course, that the real goal should be to shrink the burden of spending relative to GDP). But before answering this question, it’s important to understand that the aforementioned 10-year numbers are a bit misleading since we can’t see yearly changes. 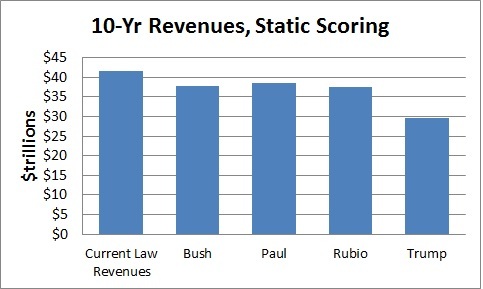 In the real world, pro-growth tax cuts presumably lose a lot of revenue when first enacted. But as the economy begins to respond (because of improved incentives for work, saving, investment, and entrepreneurship), taxable income starts climbing. 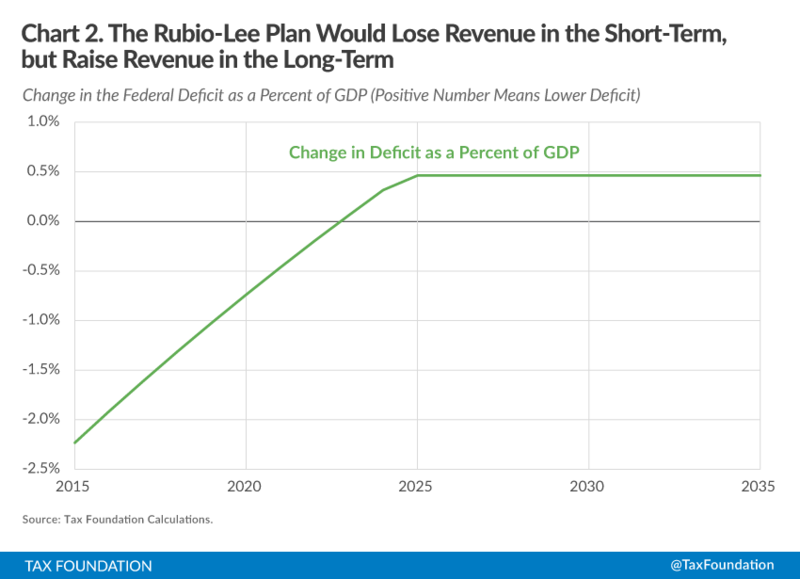 Here’s an example from the Tax Foundation’s analysis of the Rubio plan. As you can see, the proposal leads to a lot more red ink when it’s first implemented. But as the economy starts growing faster and generating more income, there’s a growing amount of “revenue feedback.” And by the end of the 10-year period, the plan is actually projected to increase revenue compared to current law. So does this mean some tax cuts are a “free lunch” and pay for themselves? Sound like a controversial proposition, but that’s exactly what happened with some of the tax rate reductions of the Reagan years. To be sure, that doesn’t guarantee what will happen if any of the aforementioned tax plans are enacted. Moreover, one can quibble with the structure and specifications of the Tax Foundation’s model. Economists, after all, aren’t exactly famous for their forecasting prowess. But none of this matters because the Tax Foundation isn’t in charge of making official revenue estimates. That’s the job of the Joint Committee on Taxation, and that bureaucracy largely relies on static scoring. Which brings me back to today’s topic. The good tax reform plans of certain candidates need to be matched by credible plans to restrain the growth of federal spending. Fortunately, that shouldn’t be that difficult. I explained last month that big tax cuts were possible with modest spending restraint. If spending grows by 2 percent instead of 3 percent, for instance, the 10-year savings would be about $1.4 trillion. And since it’s good to reduce tax burdens and also good to restrain spending, it’s a win-win situation to combine those two policies. Sort of the fiscal equivalent of mixing peanut butter and chocolate in the famous commercial for Reese’s Peanut Butter Cups. P.S. Returning to my interview embedded above, I suppose it’s worthwhile to emphasize a couple of other points. Failure to reform the tax code is a recipe for gradual economic decline. There’s a downside to creating more non-taxpayers. The national sales tax should be off the table until the 16th Amendment is repealed. The flat tax is the gold standard of tax reform. There are many moving pieces to tax reform, so plans shouldn’t be judged solely on the basis of tax rates. Today, I still think it’s an uphill battle. But if candidates begin to put forth good plans to restrain spending, the odds will improve. Conservatives are people who don’t “believe” in evolution, reject the idea that atoms can be split (“No one’s ever seen one,” Mach said), think rich people make jobs when they export U.S. money to banks in the Bahamas, that the Bahamas are in no danger from the effects of global warming, and believe the Rahn Curve is real? And the evidence that the Rahn Curve is any more substantial than Ebenezer Scrooge or the fictional Laffer Curve, is . . . What? Means testing flattens the effort-reward curve just as much as taxation. The effect is the same. So does regulation. I may keep more of my money with low taxes and be able to partially reclaim funds given to the collective if there’s no means testing. But if the road to buying what I want is blocked — say I want to buy something that produces carbon dioxide — then my money is partially worthless. Again, the end result is the same: Flattening of the effort-reward curve, less motivation, marginally more mediocrity and, the most important of all: marginal loss of competitiveness on the world stage. Small differences in competitiveness can easily drop your nation out of the group of most competitive in the world. Then decline becomes deterministic — aided by the vicious cycle whereby voters, the more stressed they become the more they flatten the effort-reward curve even further. None of the proposed tax plans address the disincentives created by means testing. Therefore all are half baked. First, we are solidly on the downward slope of the Rahn curve, so spending restraint is needed. Second, spending reflects the percentage of the country’s resources controlled by government rather than individuals. Resources are more effectively utilized by private markets, because of the profit motive. Government spending has no such guide to indicate when spending is effect and when not. Why can’t we apply “sequester” approach to entitlements? Because of the law? OK, change the law. Here’s a thought. Sequester (hold), say, Social Security benefit payments at present levels (no increase) or raise retirement age sufficient to reduce growth of new beneficiaries. Save now, or save later…. And straightforward for voter-lemmings to begin comprehending. I the end, the effects of higher growth dwarf everything. No fixed factor can stand up to an exponent in the longer term. It’s simple arithmetic. The laggards will eventually cry uncle. It’s not a matter of if, but when. You assume restraint in spending is a virtue. Why? Frugality is not a virtue in itself, but only as a tool to a higher and better goal. The goal of breaking America on a cross of poor people, is not neither higher nor better. Anyone who divorces themself from reality to propose a plan to “restrain spending” instead of working to make and keep America good and great, lacks the moral fiber to be an elected official.